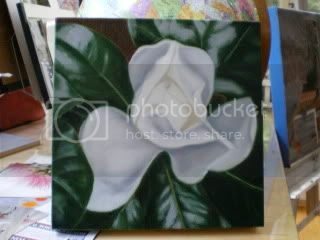 Here’s one of the first flower paintings. I went back over the leaves this afternoon, but white takes slightly longer than forever to dry, so refining the petals will have to wait. I hope I can keep the soft, gauzy feel when I deepen the value changes. I want all the creamy edges to melt. And here’s some backgrounds I’ve blended for a painting of hydrangeas, falling through the frame like it’s raining hydrangeas, and another magnolia. I’m not sure the opalescent colors will read on this photo, but you get the idea. There is something very relaxing about doing small paintings with a single focus, after working for months on large, complex paintings. Here’s Blood & Knavery Hot – I added the burnt match and the wisp of smoke from the candle, all the detail of the B&K plate, and brightened up the book pages yesterday. B&K Cold is lagging a little behind, but not far. At last count, I’m working on seven paintings. By the 18th I’ll be working on 13, counting the six small works for the Hand to Hand project. I’ve gessoed the wooden cut outs and am ready to start. My goal is to finish all of these by the end of August. Meanwhile, I am not starting anything else, no matter how tempting the idea is. I feel like Ben-Hur during the chariot race. On the positive business side, HHFA sold the Delft Swing, and last Friday we shipped Rembrandt at the Kunsthistoriche to Hawaii. A devoted acolyte of the gallery wrap, I saw my painting ‘The Interval’ framed today at Huff Harrington Fine Arts and I’m a convert. Worked on the Jordaan painting, mostly adding texture to the rug and bolt of velvet. It felt like weaving with paint. Boosted a few highlight areas and deepened some darks. I’m down to the fringe on the rug, the spokes on the bicycle wheel, and the two loose strings on the viola. It seems to be coming to an end very quickly all of a sudden. I’ve painted the Rembrant sketch on the Kunsthistoriche sofa, worked a lot on the window view and red sketchbook. More to do on the wooden foot of the sofa and the top half of the marble column. Robert wired the Palais Lichtenstein library painting for me today and I think I’ll be varnishing it this weekend. I bought a small (10×10) canvas to do a sliced tomato. There is something about painting with multiple vibrant reds and adding the glisten I just have not tired of. I also took a walk yesterday, that ended up being 3.5 miles round trip, to the photo developing store, to print the initial candidates for my Metamorphosis series. I am spoiled for choice there. It’s exciting and a little daunting for me to have so much work in hand. For several days I’ve been collecting bits and pieces for a complicated still life series, and taking digital photographs, switching out elements and tweaking the light. I have more items coming. Meanwhile, I still managed to do a little painting, and tomorrow will be entirely dedicated to the canvas. I worked on the copper lamp base on the far left, and added the rim of the bike’s front wheel and a layer of dark beneath and behind the bike. Lightened up the fuchsia velvet cloth. Just started turning the edge of the rug into fringe. I still need to add some dents and ridges to the scuttle, push the darks and lights, and define the leaves on the ground in the background. Last of all, I’ll paint the spokes of the bike wheel and the two busted strings on the viola. 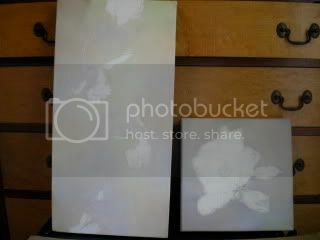 I am going to set aside the photography and tomorrow I am going to paint on the Kunst. It’s time to bring it back onto the front burner and work on it until it’s done. I’m between shows – the next one is this Thursday – and happy to be back in the studio. I laid in the red sketchbook this morning. Last week was all about the bottom half of the marble, the woodgrain and deepening the dark behind it all. Later this week, once things dry a bit, I’ll be working on the view outside the window. It needs to be both more substantial and less distinct. Then I’ll take a metaphorical deep breath and tackle the sketch of Rembrandt. I’m also entering a juried show, and applying for a residency at an artist’s retreat, which mean asking for three letters of recommendation. Humbling experience, but humility is good for my soul, therefore good for my art. I’m trying to figure out how to get a hold of certain props for a still life I want to put together. That’s an adventure all by itself. Life is good. Some days a change is as good as a rest. I needed some perspective on the library painting, so I switched back to working on the Drawing Rembrandt at Kunsthistorische. I deepened the cherry and rose velvet colors on the velvet sofa, put the third coat on the sketchbook pages, and worked on the marble behind the sofa and on the bottom of the pillar. Doing marble is very Zen, or maybe a little like doing a topographical map. Then I studied my original drawing of the Rembrandt portrait that will be going on the sketchbook page in the painting. This is a cherry red velvet sofa in the hallway by the grand staircase of Kunsthistoriche museum. I spent today working on the whipped cream- colored view out of the window. There will be a drawing of one of Rembrandt’s self portraits on the open page of the sketchbook. Working on the patterns in the marble, and have blocked in most of it, but there another layer or three of paint to come. The big challenge will be convincingly rendering the wall mounted sconce light behind and to the left of the sofa. 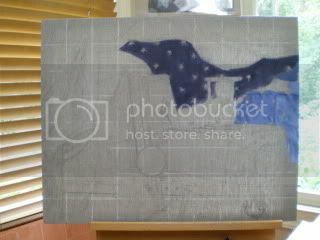 The first is nearly finished, the second is halfway done and the third is barely started, but paint is on the canvas. 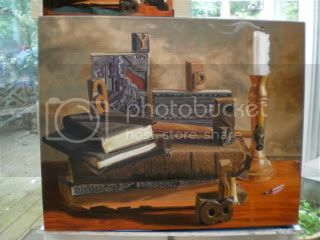 They each have companions waiting to jump on the easel – an image of books in the Leichtenstien library goes with Rembrandt’s shelf. The cello speaks to two other images – a gypsy band’s instruments (two violins and two guitars) leaning against the wall of San Paolo’s in Venice, and a battered violin for sale in a market in Amsterdam. The sketchbook on the red velvet sofa connects with the sketchbook next to the San Marco chair. It feels so good to have this well of inspiration to dip my cup into.